What is the best way to meet today's students "in the middle?" Kids today are more tech-savvy than ever before, and teachers are struggling to make sure that every student is educated according to their needs. From elementary to secondary school, students learn at different rates and have varying needs of social and educational interaction. How do we use cognitive data and blended learning to the students' benefit? Blended learning is defined as a formal education program in which a student learns, at least in part, through delivery of content and instruction via digital and online media with some element of student control over time, place, path or pace. This is critical as standard school curriculum is designed to the needs and ability of the average student, leaving many students to slip through the cracks. The face-to-face driver model incorporates most elements of traditional teaching with some online augmentation. This works best for classrooms with students at different learning speeds. The concept behind this model is to offer the opportunity of in-person instruction, teamed with an online option for students to take control of their own course work. Students who need to feel challenged can take the online portion of the course at their own pace to reduce boredom with the course load. Students who need more help and attention can take their time learning skills that are more difficult for them to master. The most traditional form of blended learning, the rotation model, allows teachers to switch been online and face-to-face learning in the classroom. Timing is often pre-set, with certain portions of the curriculum offered face-to-face and other sections required to be online. Some work may be assigned online in advance to introduce a particular topic, and face-to-face time in the classroom is then focused on mastery rather than instruction. This allows students who need additional help to have more strategic face-to-face time, which is beneficial for their development. This model focuses on online "teaching" with the teachers acting as facilitators rather than giving direction themselves. Mostly online based, flex curriculum requires strategic planning on the administrator's part, breaking up work into digestible courses and units. Typically found in secondary schools, the flex model works best with students who have issues with attendance or who are considered at-risk. There are a number of adaptive learning systems that can provide benefit to these last two models. One in particular, Cerego, offers a science-based approach to help learners acquire and demonstrate knowledge. Cerego delivers a broad, generalized tool, designed to crystallize foundational knowledge for any subject and frees up instructors to focus face-to-face time on higher-level cognitive tasks. "Cerego has demonstrated significant learning gains in higher ed and corporate training environments" says Andrew Smith Lewis, Co-Founder and Executive Chairman, "we also work with organizations such as the Gates Foundation to bring the best in breed personalized learning solutions to at risk and under-served students across the country." 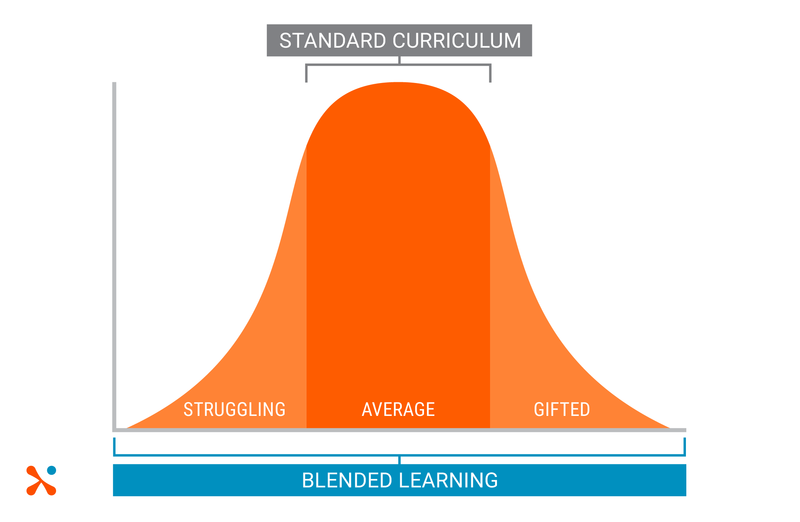 Blended learning is a step in the right direction to help students and teachers understand learning needs and cater to students that require varying degrees of one-on-one guidance. Affordable Cognitive Screening for all students is another way to identify basic learning ability and create personalized options for students to enhance outcomes. Screening for a full range of cognitive function, especially in younger children, can give teachers and administrators a better look into what would help that individual student learn. Testing for domains such as impulse control, focus, and attention gives a snapshot of how to help that child succeed - not just in learning content but also developing the cognitive skills critical for success inside and outside the classroom. If all students were screened in school, we could create a cognitive profile for children based on age and see where their skills lie on the spectrum. From there, students can be divided into groups for targeted learning based on skills like attention and emotion regulation instead of simply by age group or less defined abilities and needs. Imagine how much more effectively we can serve the youth of today by giving them every opportunity to succeed! Mylea Charvat, Ph.D. is the CEO & Founder at Savonix an evidence-based brain assessment platform that is the product of decades of rigorous research. She completed her Ph.D. Fellowship in Clinical Neuroscience at Stanford School of Medicine and was an early employee at Preview Travel - now Travelocity. Follow her on Twitter.